After a failed mission, M16’s James Bond (Pierce Brosnan, Seraphim Falls) is imprisoned by the North Korean government. Bond is finally released from jail and he is determined to unmask the person who betrayed him. His quest leads him to a mysterious British millionaire (Toby Stephens, Cousin Bette) who has developed a powerful laser that threatens world peace. Pierce Brosnan’s forth, and last, Bond movie is one of the weakest entries in the franchise. Die Another Day, Bond #20, is a huge disappointment considering the money and talents involved — it’s my least favorite Bond movie up to this point. Lee Tamahori (Along Came the Spider) directs from a screenplay by Neal Purvis and Robert Wade. The first half is actually pretty good. This section of the movie is tough and gritty, making the decidedly goofy and cartoonish second half hard to accept. Roger Moore could get away with silliness because he always played Bond in a droll, easy-going manner. Brosnan’s deadpan approach to everything makes the movie’s ridiculousness comes across as high camp. And, believe me, Die Another Day has lots of ridiculous moments. 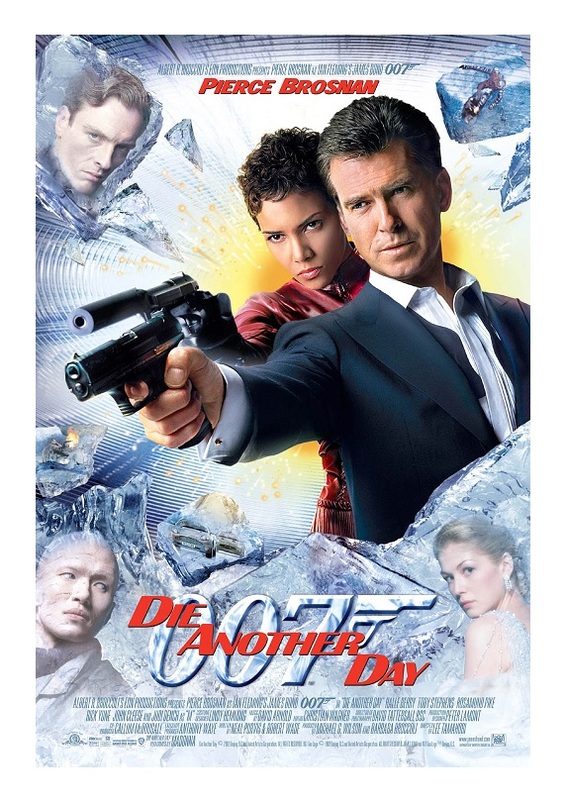 Although the franchise was never grounded in reality, I thought Die Another Day crossed the line more than a few times. The invisible car and the ice castle were just too much. The silliness doesn’t stop here. Bond swims in below freezing waters, but he looked as he had just taken a big dip in the warm Caribbean Sea. The supporting cast runs hot and cold. Halle Berry (Monster’s Ball) — she plays “Jinx” — has this “what-am-I-doing-here?” look throughout the movie. Toby Stephens’s main villain is boring. I did like Rosamund Pike (Gone Girl) as an undercover MI6 agent. Michael Madsen (Reservoir Dogs) plays Jinx’s boss. Judi Dench (Shakespeare in Love) and John Cleese (A Fish Called Wanda) return as “M” and “Q” respectively. Deborah Moore, Roger’s daughter, has a small role as a Flight Attendant. Madonna sings (she also has a cameo as a fencing instructor) what I consider the series’ worst song — it’s just terrible. I’m an ’80s kid so it goes without saying that I have lots of love for Madonna, but I can’t defend this song. She wrote the lyrics with Mirwais Ahmadzaï. Composer Michel Colombier wrote the music. Again, a horrible, horrible tune! Brosnan left the series on a disappointingly flat note. The actor himself later said that he wasn’t happy with the results and I have to agree with him. It’s really too bad that Brosnan’s swan song is one of the worst films in the franchise.